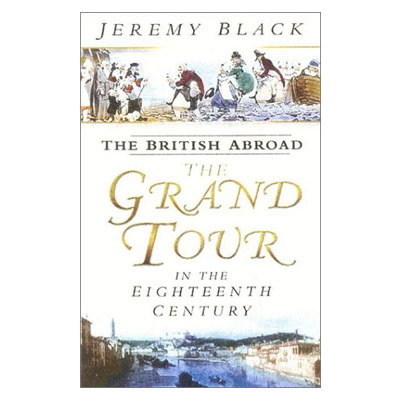 The British Abroad: The Grand Tour in the Eighteenth Century, by Jeremy Black (2003). The eighteenth century is my favourite period in history and this means that I end up reading a lot about it! I have recently read The British Abroad: The Grand Tour in the Eighteenth Century, by Jeremy Black. This very detailed book covers a great amount of information about the British on their Grand Tour of the Continent during the eighteenth century, at a time when tourism was increasing in popularity. Whilst the conventional tour was generally limited to France and Italy, sometimes people decided to venture further afield according to their particular interests. Switzerland, the Low Countries (modern day Austria, Netherlands, and Holland), and Germany were all sometimes added to the itinerary. Some places were visited less commonly, such as the Balkans, Turkey, Scandinavia, Poland, Spain, Portugal, Russia, and Greece. The traditional concept of the Grand Tour is principally that of travelling young noblemen and gentlemen of the aristocracy, whom had finished their education in England but were too young to have the management of their estates. For these young men, travel was seen as a way to keep them out of trouble and hopefully further their education by more extensive and firsthand knowledge of how things operated in other countries. It is interesting to note that there were other types of tourists as well, particularly in the second half of the eighteenth century. Older tourists, women, family groups, people who travelled for health reasons, and the ‘middling sort’ were all frequenters to the Continent, and this marked a change in the purposes of tourism, from primarily an educative focus to one of leisure. 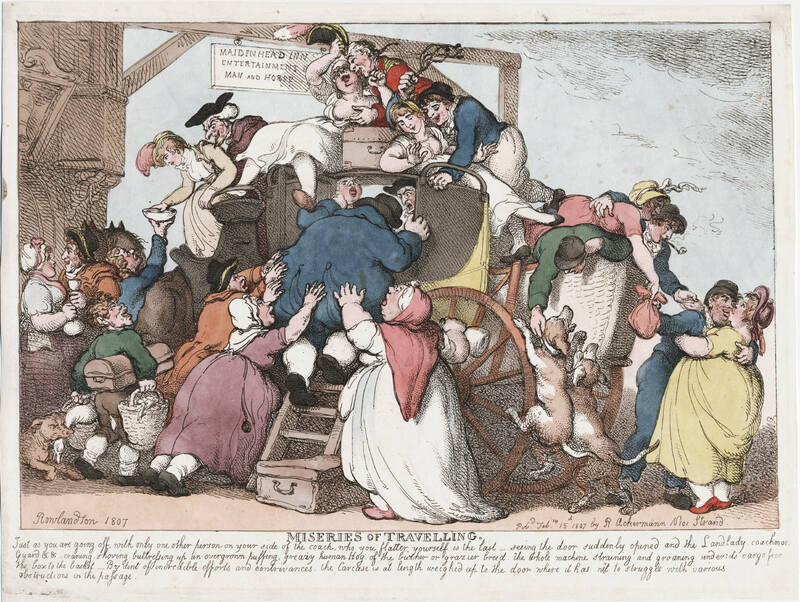 Eighteenth century tourists had to pay for very similar things as modern tourists do: accommodation, travel (boat, carriage and horses), food, and souvenirs (like artworks). They also had other expenses, such as gambling, hairdressing and tailoring, entertainments (theatre and opera), dancing and language ‘masters’, and tipping for servants. Naturally, the people who travelled needed to have an independent income from home. Sometimes this income was supplied by parents or guardians who funded the trips of their children. For others this income came in the form of their estates or investments. It is misleading to assume that those travelling were all the richest Earls or Lords or even titled gentlemen, however those that did venture out of England did need to have sufficient income to meet the expenses incumbent on an often lengthy trip. We had not gone far on our way to Dusseldorf when we perceived our postilion to be a very obstinate fellow, who notwithstanding all the signs we could make, would not move beyond a foot’s pace, till the gentleman got out to walk, and then he endeavoured to ride away from them. We were near four hours going ten miles to Opladen; here the master of inn used all his eloquence to make us pass the night, but finding it was all labour lost, he was near 40 minutes before he produced the horses with a postilion as slow as the last. Threats, entreaties, signs were as ineffectual as with the other. We still moved on, our accustomed funereal pace […] between one and two [am] the carriage stopped at the gates of Dusseldorf, having been nine hours coming 21 miles […] We found, as we knew we should, the gates of the city shut, and had therefore the pleasure of sitting in the carriage till five o’clock when they were opened. The options for food and drink were also often limited when travelling through the countryside. Tourists often resorted to carrying food with them on their journeys, such as cold meat, bread, eggs and wine. Tourists visiting larger cities often complained about the differences between the traditional English meals they were used to and the more spiced Continental foods. Even with such differences in cuisine, many people also recorded good reports of the foods they encountered in different areas. … the worst roads I have yet seen in Germany. The carriage broke into pieces before we got to the end of our journey, fairly separating the fore part of the chaise, from the hind, leaving us miserable and ridiculous spectators in the middle of the highway, whilst the postilion drove away with the coach box and fore wheels. Mr Hubert was fast asleep when this happened, and I was reading Peregrine Pickle’s verses on Lady Vane, but we were both obliged to change our easy situation for that of a hard trotting chaise horse, with miserable saddles so bad that we were ashamed to ride into the town, therefore alighted at the gate and walked to the inn. Sexual adventure and intrigue was one aspect of entertainment available in the large Continental cities, such as Paris and Venice. The contraction of venereal disease was often one of the unfortunate results, but it was not always a big deterrent as eighteenth century medicine was believed to cure the distemper. The sexual choices ranged, with a ready availability of street prostitutes and whore houses, as well as paid mistresses and married women who were prepared to have sexual liaisons. It is observable, that the French allow their women all imaginable freedoms, and are seldom troubled with jealousy; nay, a Frenchman will almost suffer you to court his wife before his face, and is even angry if you do not admire her person: And, indeed, by the liberties I have often seen a married lady use, I have been at a loss to distinguish her husband from the rest of the company. Gambling was also a prevalent entertainment in polite society, as admission to these circles required tourists to gamble large amounts for long periods. It appears to have been harder to avoid than it was in England, due to the lack of alternative company in foreign lands. …last night a party of them, about a dozen, drank thirty-six bottles of burgundy, claret, and champaign, (as our landlord showed us in his book) and made such a noise till six in the morning we could not sleep. Other more constructive entertainments included music (operas and orchestral concerts), theatre, viewing and purchasing artworks (both paintings and sculptures), and interest in architecture. It is apparent that the British were appreciative of all aspects of the arts, often giving insightful critiques in their letters home. The musical culture in London was well established, giving the tourists ample opportunity to appreciate good music, and many of the richer portion of tourists spent much time and money purchasing antiquities to take home. One of the primary benefits that the Grand Tour was supposed to provide to a class of gentleman who would soon play a role in the governance of their own country, was to educate them about the political systems in other countries. Often this information was difficult to arrive at due to language barriers and the need for access to the Court, and even when these hurdles were overcome sometimes political conversations were not encouraged. little to be seen but the appearance of dirt and poverty – the people in its neighbourhood are like its inhabitants – effect of bad government and high taxes. It is said that the Kind or Sardinia draws annually 170,000 pounds from his subjects in Savoy, which is supposed to be equal to 3/4 of the product of their labour and property. The French Revolution ultimately put an end to the Grand Tour. Initially the events in France were a great curiosity and did not seem overly menacing, with a few tourists even visiting Paris with the intention to witness some of the revolutionary beginnings. However, during 1792 there were surges in crime in France and war was declared between France and Austria. In 1793 the Reign of Terror began, where the highly unstable French government was continually overthrown and ruled by various political parties, who each promptly killed all their opposition, or “enemies of the revolution”, when they were in power. Prussia, Britain, Holland, and Spain all became involved and Continental travel was never quite the same. This book has enormous and sometime tedious details of the personal accounts of people who embarked on the Grand Tour. Whilst the level of detail could be boring to those who are not as interested in history, it does give a wonderful sense of the complexity and variety of eighteenth century experiences across the Continent. I would recommend it to anyone who enjoys delving into the depths of historical personal experience and is interested in the details and differences between these experiences, rather than those who prefer a general historical overview.